As a Microsoft accredited Cloud Accelerate partner, LeeShanok can help your company transition to Microsoft Office 365 smoothly. Microsoft Office has long been hailed as the leader in office production systems. Now the addition of Office 365 is another revolution in the way modern businesses can operate. This takes the ease and universally accepted rules of the Microsoft Office products and blends them with the speed of cloud computing. Modern business moves quickly and being forced to email documents or use flash drives can often delay production. Additionally, it offers a variety of products that consolidate all business operations into a single system. Company branded email, scheduling, shared folders for documentation, and instant messaging are all available within the same service that permits real time editing between multiple collaborators on a variety of devices for all primary Microsoft office systems. This is an ideal option for businesses large or small. Provide technology access to employees without desks or laptops. Save costs associated with typical upgrades and maintenance that are addressed automatically with Business Productivity Online Suite. Save costs through standardization of IT. Upgrade to latest technology and stay current effortlessly. Enable workforce mobility and faster connectivity. Integrate newly acquired companies faster. 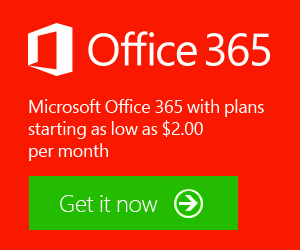 Trying to decide between Office 365 and Google Apps? We can help! Select the link for a comparison of the features of each.